Why the Trucker? Simple. A touring bike’s job is to go the distance and then some while carrying you and your gear, all in relative comfort. The Long Haul Trucker was designed in all aspects to do exactly that. 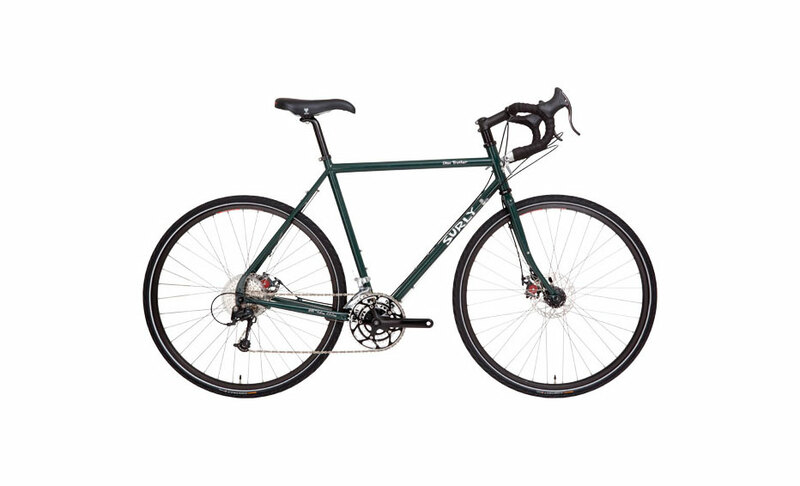 Its low bottom bracket and long chainstays provide comfort and stability. There is ample tire clearance for larger tires (larger tires soak up a lot of road static) with room for fenders too. The frame’s tubing is thicker-walled and larger-diameter than standard road and sport-touring frames, and this pre-tunes it for the weight of cargo. And it’s got all the braze-ons, from rack mounts to water bottle cage bosses to spare spoke holders. Like all SURLY frames, it’s made of CroMoly steel. Why steel, foremost is the ride quality a well-designed steel frame delivers. It doesn’t hurt that steel is relatively inexpensive, or that it is more easily repaired than aluminum, carbon fiber or titanium. You’ll probably never need to have the frame repaired, but if you do you’re more likely to find someone who can weld steel than someone who can weld ti or aluminum. Repair carbon fiber? Good luck with that.